Watch video interview here. Joseph Mbura, a chemistry and math teacher at the W.B. Saul High School for Agricultural Sciences in the Roxborough section of Philadelphia has loved gardening since his boyhood days in the Kenyan countryside where crops were grown both for food and a source of income. He started a small organic garden on a section of the school’s spacious grounds to show his students that they, too, can grow their own food. He raises a traditional black bean plant for its succulent leaves which then gets steamed and mixed with onions, tomatoes and spices in a beef or chicken stew. In another plot he has just cleared he will grow “chinsaga,” another green. 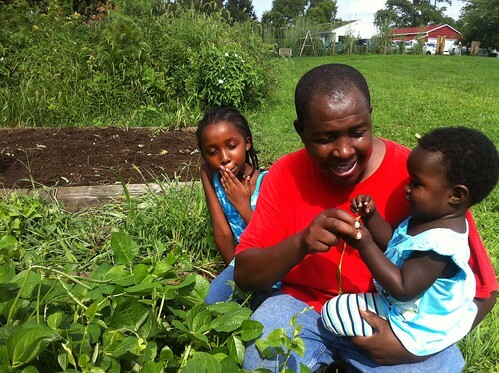 By Mbura’s side is his daughter Daisy who has her own garden at home and cradled in his arm, his younger daughter, Lily, who he hopes will follow the growing tradition. Watch video here. 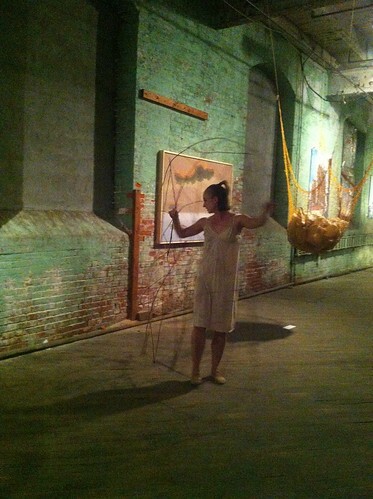 Ellie Goudie-Averill of Stone Depot Dance Lab performs structured and improvisational dances amidst art installations in the warehouse space of Pieri Creations in the Frankford section of Philadelphia. She talks about how a poetry workshop by Philly poet C.A. 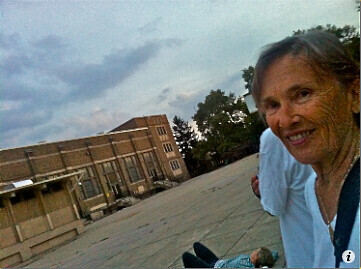 Conrad inspired her to write dance instructions for her "Serpent" piece for her part of the bill of "Make it, Break it, Rebuild it," a series of dance performances for the Philadephia Live Arts/Fringe Festival. Averill narrates her first of two dances with a large, branch braided shield-like object, Averill talking about how it's hard to go to sleep with the television on and how 60 some percent of people aged 20 to 37 get their news primarily from Jon Stewart. "Experimental movement artist Zornitsa Stoyanova. Often times theatrical, her collaborations explore non linear stories, movement invention, spoken word, and object installation." From the Philadelphia Live Arts Fringe Festival 2012 program description. When we walked into this performance, Stoyonova, dressed in large inflated, translucent plastic bags including one over her head was making fine and deliberate movements, sometimes just with her hands which drew our focus, trying to elicit meaning or purpose to their transformation. Watch video interview here. York Pa. County Fair - Fun Times! The "Procrastinators" are a troupe of three drummers,out of San Diego who wander the fairgrounds and stage impromptu performances using common objects like water cooler bottles and kitchen pans. They enliven their act acrobatic flairs and frequent dashes of humor. They work for gotdrummers.com, a larger outfit which dispatches drummers across the country for a variety of gigs. A sheep gets meticulously sheared and primped by its owners friends, getting ready to be judged. In a tent is the Amercian Steam Engine Society's antique farm machines show. One large vehicle is a "manure spreader" by Chuck Cusimano of Glen Rock, PA. for politicians. At the front over a mounted toilet is a sign which reads "For BiPartican input only- For Politicians Use Only". Other signs aboard the tractor lampoon politicians like the one with a cartoon of the Democrats' donkey and the Republicans' elephant and the words, "Sure you can trust us, Just ask an American Indian." The Society's 55th annual "Steamorama" runs October 4th through 7th, 2012 in York. In the men's room, two men who describe their work as "self contracting" are stationed at either end and pop up from their chairs to proffer a dry paper towel as soon as someone has finished washing their hands. In between times one will sing and other spray wipe the urinals. A muscular tout carries a hand made poster saying "WHATYA BENCH?" and offering $100 prizes as he snakes his way through the fair, trying to lure people to the staging area where a hunk with a microphone cajoles bystanders to benchpress a 225lb barbell or lift a 500 pound barbell with car tires at either end. I went to a party in West Virginia and it was a guy’s retirement party. And he had this t-shirt on and it said “Glasgow, Scotland” because he was in the military, he was in the Marines, or Navy that one, one of three. And we’re having a few drinks and someone says, you should go up to the microphone, it’s Karaoke and say you’re Kaley’s son from Scotland. I said, “I can’t do that.” He says, “Come on.” So eventually we had a whip around. And the whip around was up to sixty dollars and being Scotch, you can’t turn down that money. So I went up to the microphone. I was like, “It’s finally great to meet my Dad bringing me here to meet at his retirement party.” Half the party knew I was doing it but the other half didn’t. So it was like, “Chhhh!” But it turned out the guy knew, he found out this was going to happen. 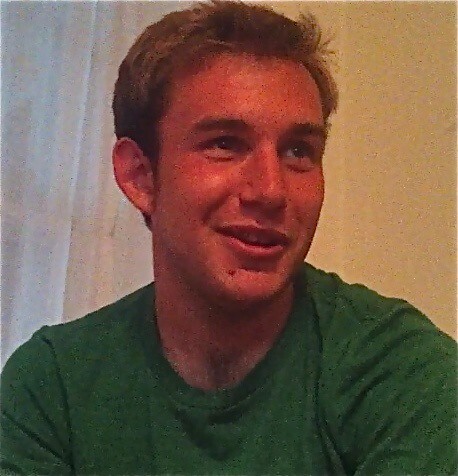 He stood up, come up and just hugged us for a good five minutes. I was standing there, I didn’t know he knew. So I was kind of thinking this is great, he thinks, this guy doesn’t know. And then his mother comes from nowhere so gives us a hug. “It’s great to meet you now.” “Oh, you too.” And eventually I found out they knew. But later on I’m talking to this girl at the party and getting a bit closer to her. It’s going all right. A guy comes up to me, “You all know she’s your cousin.” And I’m like, yeah. “It’s alright now, you’re in West Virginia.” I thought it was brilliant"
As related by a UK Elite soccer coach who, for this story, prefers to be identified as "John Deere."